These tender, juicy spareribs are deliciously tangy and a snap to prepare. They are baked with a combination of pineapple, ketchup, vinegar, sugar, soy sauce, and other seasonings for a terrific sweet-and-sour flavor with an Asian flair. The ribs are great for a game-day party or a sit-down dinner. And, if you prepare this recipe using rib tips, instead of spareribs, they make a tasty appetizer that can be kept warm in a slow cooker. Heat the oven to 325 F/165 C/Gas 3. Line a large baking pan or roasting pan with foil and set aside. Remove the silverskin from the bone side of the racks of ribs. Pat the ribs dry with a paper towel. Cut them into serving-size portions (two- to three-rib sections) and sprinkle both sides with salt and pepper. Arrange the ribs in the prepared pan, cover it tightly with foil, and bake for 1 hour or until nearly tender. Drain off all of the excess fat. While the ribs are cooking, make the sauce by combining the brown sugar, cornstarch, salt, vinegar, ketchup, pineapple, and soy sauce in a saucepan. Stir to blend and cook over medium heat until slightly thickened. Increase the oven temperature to 350 F/180 C/Gas 4. 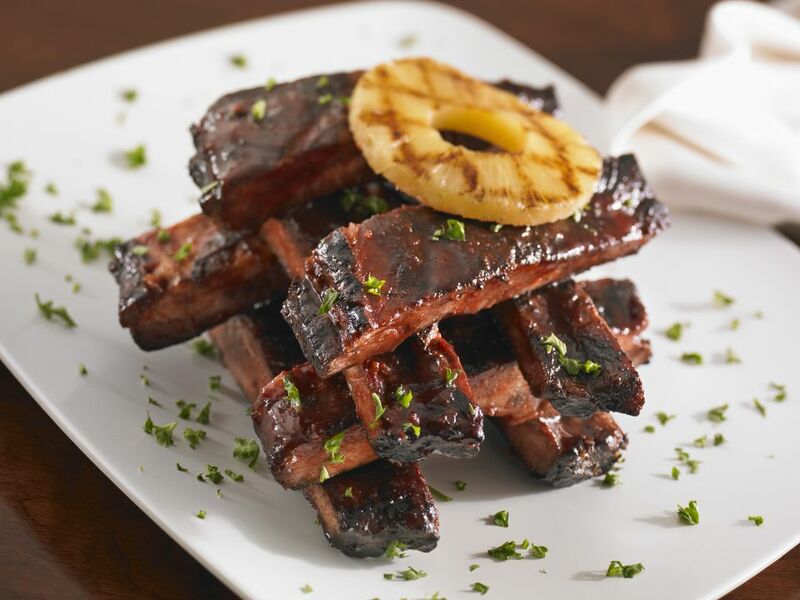 Drizzle or brush the all of the pineapple mixture over the spareribs and bake uncovered for an additional 30 minutes or until completely tender, basting frequently. Serve your ribs traditionally with coleslaw and fried potatoes or potato salad, baked beans, and cornbread or Southern-style buttermilk biscuits. Spareribs make for excellent eating and they are versatile because pork goes well with so many different flavors. If you want to enhance the Asian spin on this recipe, add 1 teaspoon of Chinese five-spice powder to the pineapple mixture while cooking. Replace the pineapple with 1 (14-ounce) can of peach slices that have been drained and then chopped finely. To grill the ribs, bake them as directed for 1 hour or until nearly tender. Take them out of the oven and finish them on a grill over medium coals for 20 to 30 minutes, basting them frequently with the pineapple sauce.